Recently we’ve been talking about long-distance repair, and how any probe launched beyond the Solar System is going to have to fix its own problems rather than relying solely on transmissions from Earth. New Horizons, halfway to Pluto/Charon in terms of distance, isn’t yet in that category. It’s going to eventually make its way into the Kuiper Belt, but for now, it’s close enough for controllers to wake it up periodically for checks. In fact, the next wakeup call, which comes tomorrow, begins a nine-week period of rigorous tests. Long-term missions like New Horizon demand annual checkouts, and this one (as opposed to last year’s) is to be comprehensive, ranging from conducting heliospheric cruise science to uploading a series of code enhancements and bug fixes to the spacecraft’s fault protection software. The spacecraft’s backup systems will be checked and its seven scientific instruments re-calibrated. Principal investigator Alan Stern describes the process in his latest report. I wanted to work New Horizons in this morning anyway because of Ron Miller’s image in that report of what we might find when the spacecraft reaches its destination. 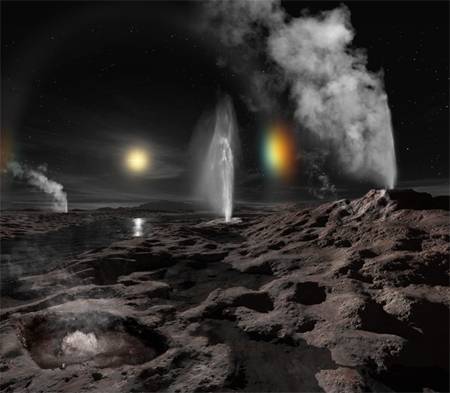 After the surprises we’ve had every step of the way in exploring the Solar System, it wouldn’t be at all out of line to find geysers like these on Pluto — think of the ‘ice volcanoes’ of Triton, or the geysers of Enceladus. Here the artist is imagining liquid nitrogen or methane as the source, creating a weird and evocative landscape that we’ll glimpse only too briefly come the 2015 flyby. Not all fixes to a spacecraft involve repairing malfunctioning systems. In the case of New Horizons, it’s also necessary to keep a close eye on the course. With the vehicle well into the outer Solar System, it’s interesting to speculate about what forces could be causing the need for a course correction. No, it’s not the so-called ‘Pioneer Anomaly,’ but the reflection of thermal photons from New Horizons’ radioisotope thermoelectric generator (RTG) striking the back of its high-gain antenna. A tiny effect multiplied over four years has consequences. The fix is to be a June 30 course correction involving a change in speed of about 1.5 kilometers per hour. The 30-second thruster burn will make New Horizon’s first course change since late 2007. Also coming up this summer are cruise observations of Jupiter, Uranus, Neptune and Pluto itself, along with four weeks of observations of the space plasma environment near the orbit of Uranus. Eventually we’ll be sending missions to destinations much further than Pluto/Charon. As of this writing, New Horizons is 2,506,760,000 kilometers from the Sun, making for a light-delay time of 2 hours, 12 minutes. Getting around light delays of months or even years will involve the kind of AI systems we’ve talked about in recent posts. The Project Daedalus starship study envisioned robotic ‘wardens’ that could handle needed repairs, but these days we can talk about ‘evolvable’ hardware and ‘genetic algorithms’ as we look toward systems that can heal in-flight maladies and create the necessary tools to keep a space probe whole. Looking at that imaginative image… It’s just too bad that we couldn’t have deployed some type of rudimentary lander to grab a half dozen photos before freezing dead solid, kind of like the one on Titan. Someone should design a general purpose rudimentary softball-sized lander with a camera and radio that would work on just about any solid planet or moon in the solar system, and every time we send out a probe, just hang a few of these off and land them where convenient. Nothing fancy, just some snapshots from the surface. Fascinating prospect of exploring “strange new worlds” – and more than PLuto/Charon but maybe another KBO or two. Would be amazing if PLuto proves to have liquid on its surface, but I think the pressure’s too low for liquid N2 and too cold for methane. Maybe the equivalent of localised melts raising the temperature enough for “steaming” pools of N2 to form? Mark: Landing as a side-project (with little propellant overhead) is only feasible when there is an atmosphere thick enough to brake in. Even then, landers will have to be specially designed for each target, I am afraid. During such cruise observations, will New Horizons get better images than ground based telescopes significantly before its arrival at Pluto? If so, how soon? Sure you can make a lander, it would just become a penetrator immediately after “landing” on the surface. :> It might even kick up some nice dust for they probe that’s flying past. It might be interesting to deploy a softball (or larger) size mini-probe or two incredibly close to the surface, or on the other side of the planet/object if it’s a 1 time flyby. It might also open up some interesting science options besides photographing the other side up close.